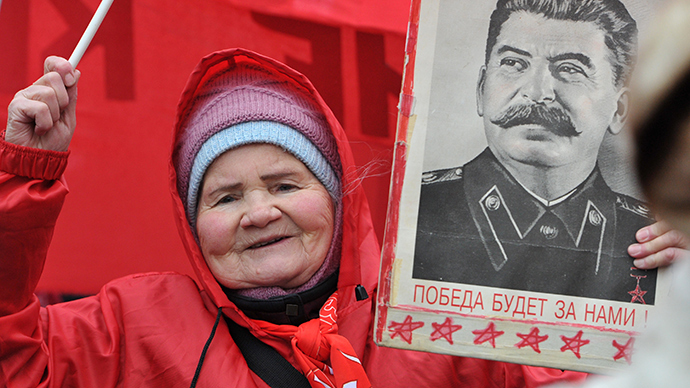 Communist Party MPs in the State Duma have prepared an address to the president requesting the city of Volgograd be renamed as Stalingrad, and that Stalin’s name and a monument be given to a Moscow square. The address has already been approved by party head Gennady Zyuganov and Deputy Duma Speaker Ivan Melnikov, and it will be submitted to the lower house in mid-February, Izvestia daily reported, quoting unnamed sources from within the party. The authors state that the Battle of Stalingrad played a decisive role in the war against Nazi Germany and the return of the historical name to the city would be the best way to emphasize the importance of this event. The main sponsor of the motion, MP Ivan Nikitchuk, has called it “a first step towards the restoration of historical justice” in press comments. Communists also claim that the move will be appropriate in the light of approaching 70th anniversary of victory over Nazi Germany and also because of the neo-Nazi revival in Ukraine and frequent attempts to rewrite and falsify the history of WWII. MP Aleksey Zhuravlev of the majority United Russia party told the press that the renaming of Volgograd as Stalingrad could actually improve Russia’s image, as the latter name is very well-known around the world. However, he noted that according to Russian law the renaming of a city needs to be agreed with its residents, and the people of Volgograd had already voted against bringing back the Stalingrad name. The new initiative was not the first attempt to put Stalin’s name back on to Russian maps. Communists and other politicians have maintained this controversy since the mid-1990s. The discussion became especially vocal in 2013, when the country celebrated the 70th anniversary of the Battle of Stalingrad. Then, the renaming was rejected both by the people and the authorities. Polls showed that 60 percent of Russians were against the renaming and Vladimir Putin’s press secretary Dmitry Peskov said in a press interview that Kremlin officials had never considered renaming Volgograd into Stalingrad and did not plan to put this issue on the agenda in the future. The only concession made in 2013 was the decision of the Volgograd City legislature to have the city renamed as Stalingrad for just a few days each year – on the dates of major holidays and commemorative dates. On these days, regional officials and mass media are officially required to use the name Stalingrad in documents and reports. However, already in 2015 Volgograd news sites reported that the renaming bill was almost completely ignored in the region on February 2 – the day of the Red Army’s victory in the Battle of Stalingrad.